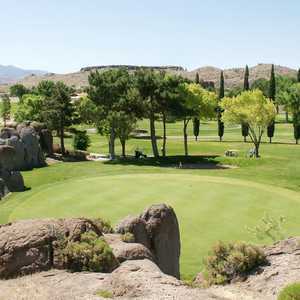 The 18-hole Cerbat Cliffs Golf Course in Kingman, Arizona is a public golf course that opened in 1973. Designed by Milton Coggins, Cerbat Cliffs Golf Course measures 6502 yards from the longest tees and has a slope rating of 129 and a 71 USGA rating. The 18-hole Valle Vista Country Club in Kingman, Arizona is a semi-private golf course that opened in 1975. Designed by Fred Bolton, Valle Vista Country Club measures 6266 yards from the longest tees and has a slope rating of 112 and a 68.